Plenty! - Cars! Cars! Cars! Oh stop with your worrying you worrier! There's plenty of oil to go around! World oil supply still plentiful, study shows. What weird timing. Republicans lose election, Detroit goes to Washington and now there's plenty of oil. We guess there's no reason to really hunker down and start looking for alternatives now since there's plenty of oil for a long, long time. Don't worry about anything! World oil production will not begin to fall for at least another 24 years, contrary to doomsday theories that supply is already in terminal decline, a prominent energy consulting group said Tuesday. Twenty four years! Whew! That's so much more than 23, we have nothing to worry about! 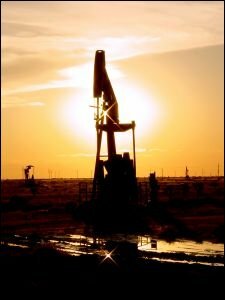 "Oil is too critical to the global economy to allow fear to replace careful analysis about the very real challenges with delivering liquid fuels to meet the needs of growing economies," said Peter Jackson, director of oil industry activity for Cambridge, a Massachusetts-based consultant to the oil, natural gas and electric power industries. Peter Jackson: I'm ready to take questions now. Jackson: I am not the Peter Jackson who made Lord of the Rings. That rockin' photo comes from Dawn Allynn. You can see more of her snaps at Smug Mug.